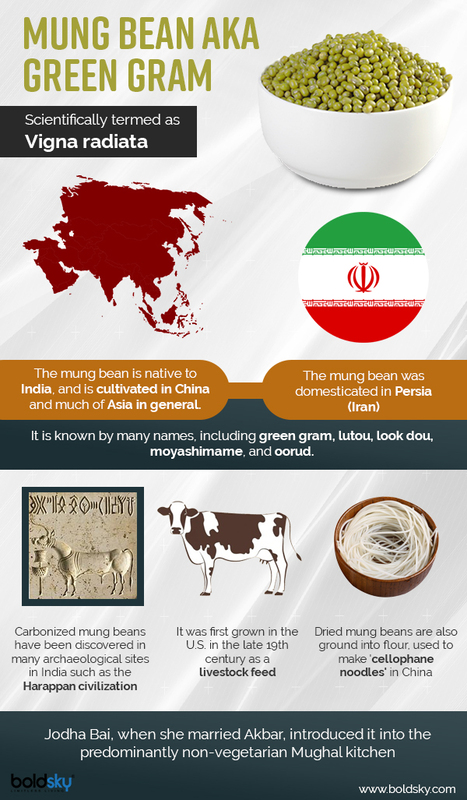 Green gram, also called mung beans, are not foreign to the South Asian countries, especially India. At least once in your lifetime, you would have eaten dishes that had mung dal in it. While the legume is fairly new in foreign lands, it has been a part of the traditional Ayurvedic diets in India for thousands of years  . Considered as one of the most cherished foods in India, green gram has been in use since 1,500 B.C. Green gram is one of the best sources of plant-based protein and possesses biological activities including antioxidant, antimicrobial, anti-inflammatory, lipid metabolism accommodation, antihypertensive, antihypertensive, antidiabetic, and antitumour effects. It is a high source of protein, fibre, antioxidants and phytonutrients  . Currently, green gram’s popularity is rising with the legume being used in everything from canned soups, restaurant dishes to protein powders. The legume is found in whole uncooked beans, dried powder form, split-peeled form, sprouted seeds and as bean noodles too. The dried green gram can be consumed raw, fermented, cooked, milled and in the form of flour. The high nutrient capacity of the gram makes it beneficial in the fight against several chronic, age-related diseases as well as heart disease, cancer, diabetes and obesity. Various studies have been conducted on exploring the health benefits offered by the legumes and asserted that it helps in preventing the onset of chronic diseases as well as in lowering inflammation, along with various other benefits  . Read on to know more about the benefits, nutrition, recipes and so on about the fascinating green grams. 100 grams of the legume have 105 calories of energy. They have 0.38 grams fat, 0.164 milligrams thiamine, 0.061 milligrams riboflavin, 0.577 milligrams niacin, 0.41 milligrams pantothenic acid, 0.067 milligrams vitamin B6, 0.15 milligrams vitamin E, 0.298 milligrams manganese and 0.84 milligrams zinc. From aiding in reducing weight to fighting obesity, consuming green gram can be extremely beneficial for your health. Take a look at the plethora of benefits possessed by the super healthy legume. Rich in nutrition, green grams are asserted to have the ability to limit the onset of cardiovascular diseases and high blood pressure. The extracts from the legume were shown to lower the level of systolic blood pressure, as the antihypertensive properties of green grams aid in reducing the narrowing of the blood vessels that cause the blood pressure to hike. It is the high concentration of protein fragments known as peptides, which can be attributed to this benefit  . Green gram is a good source of phytonutrients, which have anti-inflammatory and antimicrobial properties. They aid in improving your immunity and fights off the harmful bacteria, colds, viruses, irritation, rashes etc. The legume also improves your immune defence, protecting your body from harmful elements  . Studies conducted on the impact of green grams in improving one’s heart health asserted that regular and controlled consumption of the legumes can reduce the bad cholesterol levels. It aids in regulating the level of cholesterol by eliminating the free radicals, reducing inflammation and repairing the damages caused to the blood vessels. The antioxidant property of the legume helps in preventing the onset of strokes and heart attacks caused by the oxidized LDL cholesterols. Green gram also help in enhancing the blood circulation by clearing out the arteries  . The high amount of oligosaccharides and polyphenols (amino acids) present in green grams aid in limiting the onset of cancer. Likewise, the antioxidant property of the mung beans is beneficial in protecting your body from DNA damage and dangerous cell mutation. It is also asserted to have antitumour properties. The flavonoids vitexin and isovitexin have a free-radical destroying ability, which contributes toward lowering the oxidative stress which can cause the development of cancer  . The high amount of protein and fibre content in mung beans increases the satiety, thereby making you feel full. This will cause one to stop the need to munch on unhealthy food and snacks constantly, enhancing weight loss. It increases the satiety hormone called cholecystokinin and can aid in fighting obesity  . The B vitamins in green grams such as the vitamin B6 and folate play a significant role in controlling hormone fluctuations, and there managing the severe symptoms pertaining to PMS. The B vitamins, folate and magnesium can help lower the pain and severity associated with PMS, such as managing cramps, headaches, mood swings, fatigue and muscle aches  . Green gram is asserted to possess antidiabetic effect, which is beneficial in preventing the onset of diabetes (type 2). A study conducted on the impact revealed that the legumes can aid in lowering the blood glucose levels, plasma C-peptide, total cholesterol, glucagon, and triglyceride levels. It also helps in improving glucose tolerance as well as insulin responsiveness  . Easy to digest, the legumes are extremely beneficial in assisting the digestion process. Green gram is also helpful in detoxifying your body due to the rich content of fibre. It helps in preventing IBS symptoms such as constipation as well  . As aforementioned, green grams are rich in fibre. They help in regulating the metabolic activities in your body by increasing the overall metabolic rate. The fibre helps in reducing indigestion and acidity as well  . Green grams can aid in bettering your calcium intake, which in turn will improve your bone strength. Used as a natural calcium supplement, the legumes can protect you from fractures  . Rich in sodium, green grams can aid in improving the health of your gums as well as your teeth (rich calcium content). Regular consumption of green grams can prevent gum problems like gum bleeding, pain, reddening, foul odour and weakness  . The rich content of iron in green grams aids in the process of carrying oxygen in blood as well as in the supply of blood to all organs and tissues. It is beneficial for individuals with concentration problems and weak memory, as the iron content works towards ensuring the adequate amount of oxygen supply to your brain. This helps in increasing one’s focus as well as memory  . Loaded with vitamin C, consuming green gram can help you in improving your eye health. Working as a natural antioxidant, it aids in maintaining the flexibility of your retina and protects your eyes from external damages  . A rich source of protein, green gram is beneficial for the health of your liver. It protects your liver from any damages and ensures the proper functioning of bilirubin and biliverdin in the liver. This helps your liver from being affected by jaundice  . Green grams are known to provide radiance to the skin. The copper content in the legume works wonders by improving your skin quality and giving it a glow. It can also be used as an exfoliating face pack and scrub. It also helps in limiting the onset of wrinkles, age spots and age lines giving your skin a young and healthy glow  . As aforementioned, the copper present in green grams helps improve your scalp health and provides a shine to your hair. It can be applied in the form of hair masks to get shiny, long, strong and thick hair  . Wash and soak the green gram in enough water in a deep bowl for 3 hours. Combine the soaked green gram and green chillies and ½ cup of water in a mixer. Blend until it becomes a smooth mixture. Grease the pre-heated waffle iron with a little bit of oil. Pour a ladleful of batter in it and cook for 2 to 3 minutes. Wait till the waffles turn light brown in colour. Squeeze the lemon juice on top, and mix. Green grams do not cause or trigger adverse side effects. However, some components in the legume can be harmful to certain individuals  ,  . Due to the presence of oxalates, people with kidney and gall bladder disorders should avoid consuming green beans. It can hamper with the absorption of calcium in the body. Excessive consumption of raw green grams can cause stomach upset, vomiting and diarrhoea. Consuming green grams alone for a long period of time can result in the development of cold pain in legs, lower back, digestive diseases and chronic gastritis. Individuals with yin deficiency will experience swollen gums, perleche, etc. Pregnant women, elders and children with low immunity should not consume raw green gram. Chavan, U. D., Chavan, J. K., & Kadam, S. S. (1988). Effect of fermentation on soluble proteins and in vitro protein digestibility of sorghum, green gram and sorghum‐green gram blends. Journal of Food Science, 53(5), 1574-1575. Shanker, A. K., Djanaguiraman, M., Sudhagar, R., Chandrashekar, C. N., & Pathmanabhan, G. (2004). The differential antioxidative response of ascorbate glutathione pathway enzymes and metabolites to chromium speciation stress in green gram (Vigna radiata (L.) R. Wilczek. cv CO 4) roots. Plant Science, 166(4), 1035-1043. Aykroyd, W. R., Doughty, J., & Walker, A. F. (1982). Legumes in human nutrition (Vol. 20). Food & Agriculture Org. Morisky, D. E., Levine, D. M., Green, L. W., Shapiro, S., Russell, R. P., & Smith, C. R. (1983). Five-year blood pressure control and mortality following health education for hypertensive patients. American Journal of Public Health, 73(2), 153-162. Misra, A., Kumar, R., Mishra, V., Chaudhari, B. P., Raisuddin, S., Das, M., & Dwivedi, P. D. (2011). Potential allergens of green gram (Vigna radiata L. Millsp) identified as members of cupin superfamily and seed albumin. Clinical & Experimental Allergy, 41(8), 1157-1168. Hithamani, G., & Srinivasan, K. (2014). Bioaccessibility of polyphenols from wheat (Triticum aestivum), sorghum (Sorghum bicolor), green gram (Vigna radiata), and chickpea (Cicer arietinum) as influenced by domestic food processing. Journal of agricultural and food chemistry, 62(46), 11170-11179. Ramesh, C. K., Rehman, A., Prabhakar, B. T., Vijay Avin, B. R., & Aditya Rao, S. J. (2011). Antioxidant potentials in sprouts vs. seeds of Vigna radiata and Macrotyloma uniflorum. J Appl Pharm Sci, 1(7), 99-110. Adsule, R. N., Kadam, S. S., Salunkhe, D. K., & Luh, B. S. (1986). Chemistry and technology of green gram (Vigna radiata [L.] Wilczek). Critical Reviews in Food Science & Nutrition, 25(1), 73-105. Bell, R. W., McLay, L., Plaskett, D., Dell, B., & Loneragan, J. F. (1990). Internal boron requirements of green gram (Vigna radiata). In Plant Nutrition—Physiology and Applications (pp. 275-280). Springer, Dordrecht. Vikram, A., & Hamzehzarghani, H. (2008). Effect of phosphate solubilizing bacteria on nodulation and growth parameters of greengram (Vigna radiata L. Wilczek). Res J Microbiol, 3(2), 62-72. Nair, R. M., Yang, R. Y., Easdown, W. J., Thavarajah, D., Thavarajah, P., Hughes, J. D. A., & Keatinge, J. D. H. (2013). Biofortification of mungbean (Vigna radiata) as a whole food to enhance human health. Journal of the Science of Food and Agriculture, 93(8), 1805-1813. Beg, M. A., & Singh, J. K. (2009). Effects of biofertilizers and fertility levels on growth, yield and nutrient removal of greengram (Vigna radiata) under Kashmir conditions. Indian Journal of Agricultural Sciences, 79(5), 388-390. Shah, S. A., Zeb, A., Masood, T., Noreen, N., Abbas, S. J., Samiullah, M., … & Muhammad, A. (2011). Effects of sprouting time on biochemical and nutritional qualities of Mungbean varieties. African journal of agricultural research, 6(22), 5091-5098. Mazur, W. M., Duke, J. A., Wähälä, K., Rasku, S., & Adlercreutz, H. (1998). Isoflavonoids and lignans in legumes: nutritional and health aspects in humans. The Journal of Nutritional Biochemistry, 9(4), 193-200. Sindhu, S. S., Gupta, S. K., & Dadarwal, K. R. (1999). Antagonistic effect of Pseudomonas spp. on pathogenic fungi and enhancement of growth of green gram (Vigna radiata). Biology and fertility of soils, 29(1), 62-68. Gupta, C., & Sehgal, S. (1991). Development, acceptability and nutritional value of weaning mixtures. Plant Foods for Human Nutrition, 41(2), 107-116. Kakati, P., Deka, S. C., Kotoki, D., & Saikia, S. (2010). Effect of traditional methods of processing on the nutrient contents and some antinutritional factors in newly developed cultivars of green gram [Vigna radiata (L.) Wilezek] and black gram [Vigna mungo (L.) Hepper] of Assam, India. International Food Research Journal, 17(2), 377-384. Masakorala, K., Yao, J., Chandankere, R., Yuan, H., Liu, H., Yu, C., & Cai, M. (2013). Effects of petroleum hydrocarbon contaminated soil on germination, metabolism and early growth of green gram, Vigna radiata L. Bulletin of environmental contamination and toxicology, 91(2), 224-230. Tabasum, A., Saleem, M., & Aziz, I. (2010). Genetic variability, trait association and path analysis of yield and yield components in mungbean (Vigna radiata (L.) Wilczek). Pak. J. Bot, 42(6), 3915-3924. Baskaran, L., Ganesh, K. S., Chidambaram, A. L. A., & Sundaramoorthy, P. (2009). Amelioration of sugar mill effluent polluted soil and its effect of green gram (Vigna radiata L.). Botany Research International, 2(2), 131-135. Is Soy Good For Health? Egg Diet Plan: What Is It And Is It Effective?